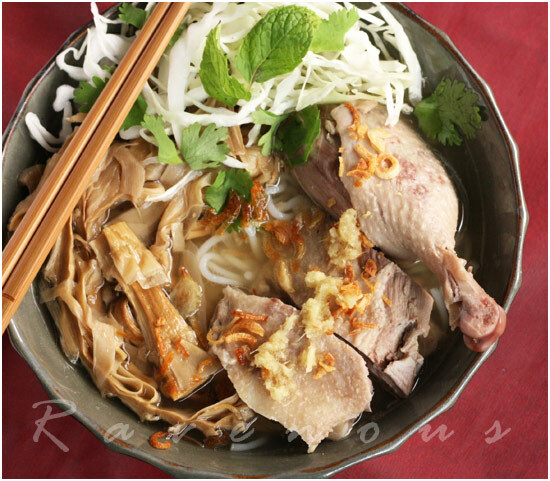 Bun mang vit (duck and bamboo vermicelli noodle soup) is absolutely one of our favorite Vietnamese noodle soups–yes, we seem to say that about all the Vietnamese soups we make–but really, who’s counting? You may not find this soup at most Vietnamese restaurants, but believe us–it’s delicious, comforting, and not any harder then making pho or other soups. The deep and fragrant broth of this soup comes from the juicy duck and along with dried bamboo. Using dried bamboo is a must–if you prefer to add fresh bamboo, that’s fine too, but don’t skip out on the dried bamboo as the flavor and texture will not be the same. We’re very particular about our broth and use chicken bones as well. But as with all good things–there is only one easy but time consuming part of this dish and that is working with the dried bamboo. 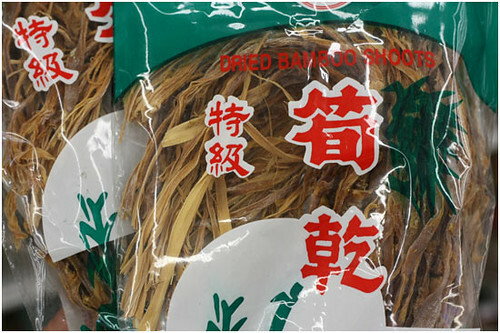 Dried bamboo is often found in most Asian markets. There are many varieties, some may be completely dried and some may semi dried (dried stiff vs. still soft and pliable). Both types of dried bamboo will need to be reconstituted and brought to a tender state by boiling. The bamboo that is dried stiff will need to be boiled for at least 2-3 times with changes of water each time which is a lot of work. We prefer the semi dried one such as this that only requires about 10 minutes of boiling to be reconstituted. Do not use pickled bamboo. Canned bamboo is also acceptable if you can’t find dried but the flavor will be slightly different. 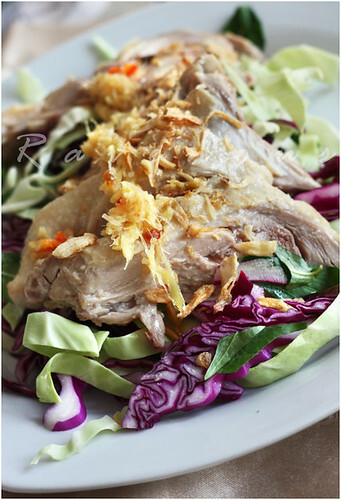 Accompaniments include a goi vit–duck salad/slaw, composed of thinly shredded red/white cabbage, herbs such as mint, coriander, perilla, topped with slices of duck and topped with a ginger fish sauce, nuoc mam gung. The ginger fish sauce is also used as a dipping sauce for the duck. During this time, boil the vermicelli and make the broth. To a large stock pot, add water, onions, ginger, sugar and salt and bring to boil. Add the entire duck and lower to simmer and poach for about 30 minutes or until internal temperature is 165 in thigh. Remove the duck and place in container covering with plastic wrap. Also, discard the onion and knobs of ginger. Adjust the broth to taste with salt and sugar (MSG if preferred) but just go slowly and trust your taste buds. When the duck cools down enough to handle, carve or shred. To make the nuoc mam gung/ginger fish sauce, you can just use nuoc mam cham and add it the minced ginger along with a few more splashes of fish sauce as this sauce is supposed to be slightly more stronger in fish sauce flavor to complement the strong flavor of the ginger. We like a lot of ginger, but use as much or as little as you like. Add a chopped red chiles to taste. To make the goi vit, combine in mixing bowl the cabbage and herbs. Dress with a bit of nuoc mam cham. Top with slices of duck and ginger fish sauce and fried shallots. The tenderized dried bamboo has an amazing complex tasted compared with fresh bamboo and paired with the duck flavored broth, it makes for a wonderful noodle soup. We like to add the goi vit directly into the soup for a textural crunchy contrast to the noodles and generously slather the duck in the ginger fish dipping sauce…. yumm!!! So don’t limit yourself with just pho….try bun mang vit and it’ll will rock your world! I agree, this is one of the top Vietnamese soups. The nuoc mam gung perfectly complements the richness of the duck. I look forward to trying this recipe. It was great meeting you at the festival. It's nice to be able to put faces with the writers/cooks. Is it a Vmese thing because I find myself loving all the soups too. They are all my fave :-). Can't seem to get enough. javaholic: It was really great to meet and share stories this past weekend at the Foodbuzz conference. Let us know how bun mang vit goes for you! Mai: It's a Viet thing and we hope it's contagious!! Thanks for dropping by my blog! Likewise, it was so nice to meet you two. I look forward to trying out your recipes. Love vietnamese food. Do you cook much with lemongrass? It's my next ingredient to try. Hope our paths cross again soon. If you ever visit the Bay Area or more specifically, San Jose, please let me know!! Linda: We're actually coming up again this weekend and going to monterrey and carmel! 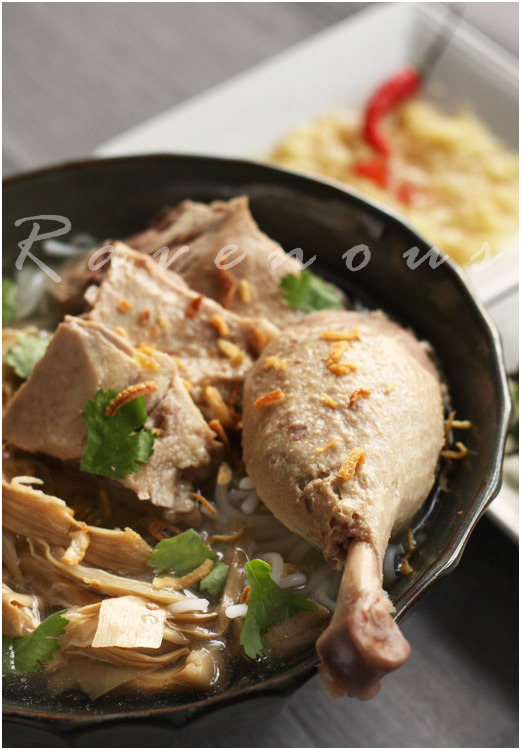 We cook with lemongrass alot esp in soups but also ga kho xa…caramelized chicken with lemongrass. and this blog: likewise, we'll def. have to make it back to NYC soon! I love the clean flavor of ginger and lemongrassI've never cooked with dried bamboo shoots—will look for them at my local market. Love visiting your blog; I always leave craving noodles! 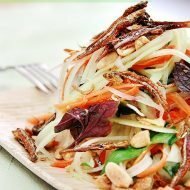 Hey, great stuff, and I love Vietnamese cooking, and am always looking for inspiration. I think I have to look no further than your fantastic photos. And the fact that they are followed by recipes is bonus! Table Talk: thank you so much for the comments! Dried bamboo is not the easiest product to work with but the end result is great! OysterCulture: Thanks so much for visiting! We love sharing bun mang vit and other Vietnamese cuisine. Sorry to have missed you this weekend at Foodbuzz. Thanks for stopping by Life With Lindsay – and looking forward to your future posts about the weekend. Beautiful photos! Your dish is absolutely tantalising and if no one told me, I would have thought it was from a restaurant menu! Delicious. I love the aromatics in there, how they must perfectly complement the duck while making it taste less fatty. I would take this over chicken soup any day! Lindsaymeyer: Thanks, hope to see you at the next FB conference! 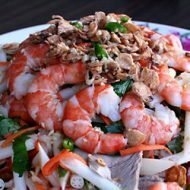 Little Teochew: that's the problem…not many Vietnamese restaurants have this dish! noobcook: dried bamboo, when cooked is wonderful! Connie: We know how much you love duck…and we do too! This looks delicious! I've never used dried bamboo, but I'd love to try it. Wow. never heard of this dish but a duck drumstick poking out of a bowl of noodles is a real attention grabber! Looks amazing. I can't believe you guys haven't run out of recipes! I guess you guys have a vast repetoire. Can't wait to read the rest of your family secrets. This sounds and looks very yummy, I love soups and I love duck, so what a great combo!! The pictures you have posted look delicious! 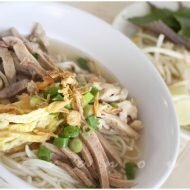 Bun vit is one of my favorites =) Curious as to how the addition of lemongrass adds to the taste and smell of the broth as this is probably the first time that I have ever seen it used in this recipe? lisaiscooking: dried bamboo takes time to cook, but worth it! 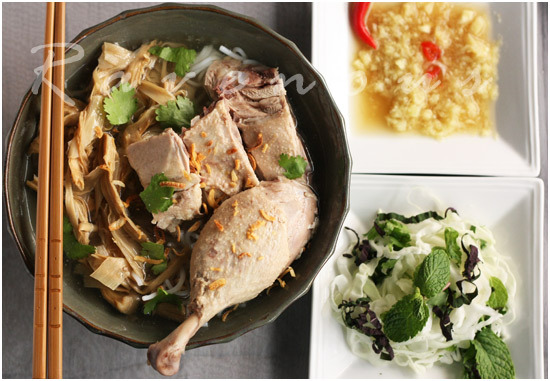 cooking gallery: bun mang vit is really delicous especially if you like duck..give it a try! Anh: you're absolutely right..lemongrass is not typically part of the traditional recipe–unlike bun bo hue where it's crucial..here we just use a single stalk for the aroma to complement the ginger–totally optional. Great minds think alike 😛 I'm cooking a huge pot of bun mang ga in the kitchen. I never use dried bamboo, does it have an earthier flavor, maybe stronger taste for the broth? Jackie: You're intuition is spot on..dried bamboo has more earthier, intense, and distinct flavor and smell as well. Give it a try next time! wow, I've never seen this dish but it sounds fantastic! I can tell that it is way too much work for me, but I'll look for it on the menu next time I'm out for vietnamese noodle soup. I'm glad to have met you guys and being introduced to your wonderful blog. I've never tried this dish before. Must be filled with robust flavors. foodhoe: it was great meeting you at the dinner..we're all about introducing lesser known vietnamese cuisine, so def. look for this dish and let us know if you try it. We know a few places in down here that serves it. tigerfish: thanks for stopping by…bun mang vit is definitly unique among the vietnamese noodle soups, so if you ever see on a menu, give it a try! You are a cook with mad skills. We have a similar dish in Penang, but the soup is infused with Chinese dried herbs. It's interesting. Dried bamboo and duck soup. 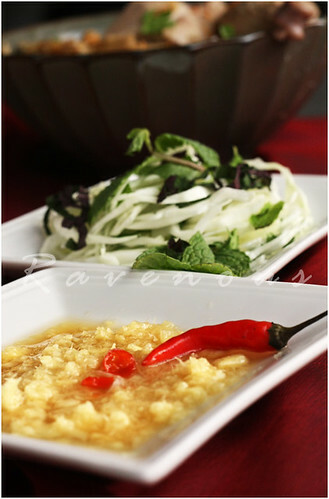 Your blog is a wonderful eye opener for me who is unfamiliar with vietnamese food. keep up the good work! This is a very interesting soup. I'm a beginner at making Vietnamese soups and broths, tomorrow will be my first time making pho. Once I get that one under my belt, I'm going to look forward to making more ambitious dishes like this one! It looks fab, and I adore the flavor that duck imparts. RM: Thanks! You must be talking about mi vit tiem…a very dark broth infused with chinese herbs..
Ellie: Everyone can make pho now…so why not share some of the lesser known stars? Fresh Local and Best: That's great–we'll look for it in your blog! man man man….you guys are truly something else, this is certainly a delicious bowl of soup. Cheers to you guys! HoustonWok: Hope you had fun during your recent trip to cali! It was so great meeting both of you! You are a beautiful couple and have such an amazing blog! I am so looking forward to keeping up with your posts! Do you two visit the Bay Area much? I live in San Jose and would love to hangout with you two and talk over a bowl of steaming noodles. I was wondering who does the cooking? Your post is beautiful. I've linked it to my blog post on a restaurant's bún măng vịt. flavorblvd: So glad bun mang vit is getting some good press! The bamboo, the fried onions, the sweet duck and broth… It’s so good!!! Looks delicious. Can you use duck wings for the duck portion? If so, about how much would be necessary? A pound plus? I made this soup tonight.. I pan fried duck confit leg for less than 20 minutes in olive oil and set aside to use as meat diced for soup topping along with crispy fried shallots. the other duck legs I added to ready made chicken soup stock to add an extra layer of flavoring then discarded afterwards since the meat didn’t separate easily off the bone. I really liked the way this came out.. will do it again. Thanks for the recipe. I also added last minute baby bok choy, oyster mushrooms to boil with bamboo, then I added chopped cilantro, mint and red pepper and sliced lime wedges were added once the soup was assemble in bowl last minute as a topping. I tried this recently in Hanoi and will be trying this at home sometime in the future. Just wondering if you know what are the small yellow egg-yolk-like balls in the bun ngan that I had?